Once, Vlad Taltos knew his trade: he killed people for a living. That skill got him his foothold in House Jhereg, running the rackets for a chunk of urban Adrilankha. Later, things happened that left Vlad a changed man, on the run from the Jhereg and frequently involved in the affairs of Dragonlords, Empresses, and even Jenoine. Far more involved than the average human. Meanwhile, in the very distant past, one of the gods fashioned an artifact—a silver figurine of a tiassa, a winged panther-like animal. To Devera the Wanderer, it's a pretty toy to play with. To Vlad, it's a handy prop for a con he's running. To the Empire, it's a tool to be used against the Jenoine. And to the Jhereg, it's a trap to kill Vlad. As it happens, however, the silver tiassa has its own agenda. 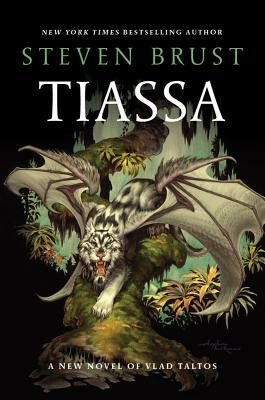 Tiassa tells a story that threads its way through more than ten years of the remarkable life of Vlad Taltos—and, to the delight of longtime fans, brings him together with Khaavren, from The Phoenix Guards and its sequels. Khaavren may be Vlad's best friend—or his most terrible enemy. Steven Brust is the bestselling author of Issola, Dragon, The Phoenix Guards, Five Hundred Years After, and many others. A native of Minneapolis, he currently lives in Las Vegas.